During our midweek Lenten services we will take a look at five places connected to Jesus’ death. Each place will expose us to the people involved in Jesus’ death. We will see people taking actions that reveal that they are not only witnesses but accomplices in Jesus’ death. Our first look tonight will be at the upper room. The upper room is a place for intimacy, a gathering familiar and cherished by Jews. The Passover celebration was not a private event, but a family and friend oriented event. In the midst of this, Jesus addresses two items of critical interest: 1) the identify of his betrayer, sin exposed, and 2) the institution of the Lord’s Supper for the forgiveness of sins. As we explore tonight we begin our walk to the cross. Like the disciples we ask “Is it I, Lord.” As we examine our hearts, we, too, will see our own sin—confessing during the service. And the solution is the forgiveness that Jesus earns for us and He gives to us through the Word, through Baptism, and especially tonight, the Lord’s Supper. We cherish the weekly celebration of the Lord’s Supper for the forgiveness we desperately need and want. 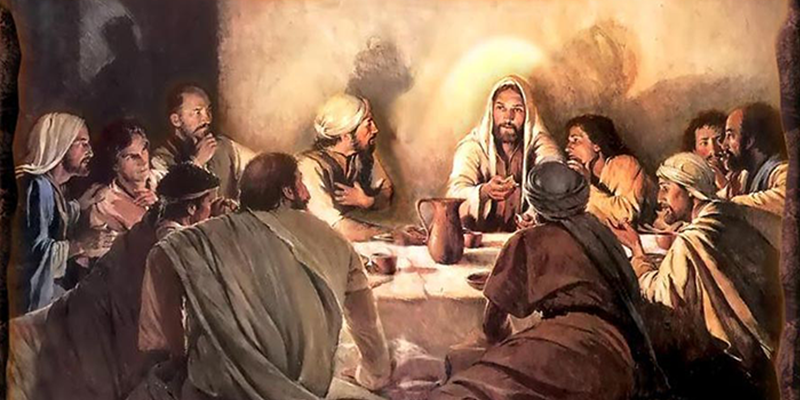 18 And He said, “Go into the city to a certain man, and say to him, ‘The Teacher says, “My time is near; I am to keep the Passover at your house with My disciples.”’” 19 The disciples did as Jesus had directed them; and they prepared the Passover.